Masters Art Quilts Vol. 2 Free Give Away!! 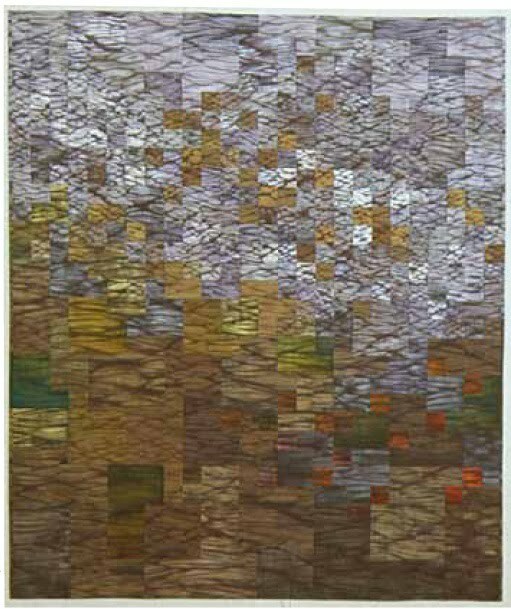 In Masters Art Quilts Vol. 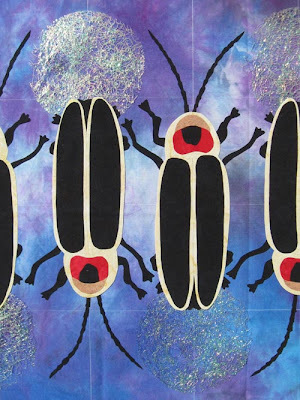 2, Martha Sielman has gathered the art work of 40 contemporary art quilters into a lush volume that is a perfect companion to Masters Art Quilts Vol.1. Each artist is represented with 6-12 pieces of their work, including some details to give a really rich overview of their style. 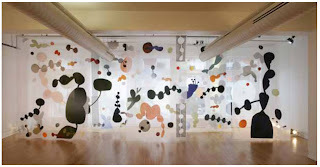 Sielman accompanies each of the artists' work with a brief description of their work, their inspirations, and their techniques. Each piece of artwork is labeled with title, year created, dimensions, materials and techniques. The book is well designed, easy to use with a softcover and front and back flaps, and the photography is exquisite. I selected several artists' work for this review to illustrate the level of work in the book. It was truly a hard decision. 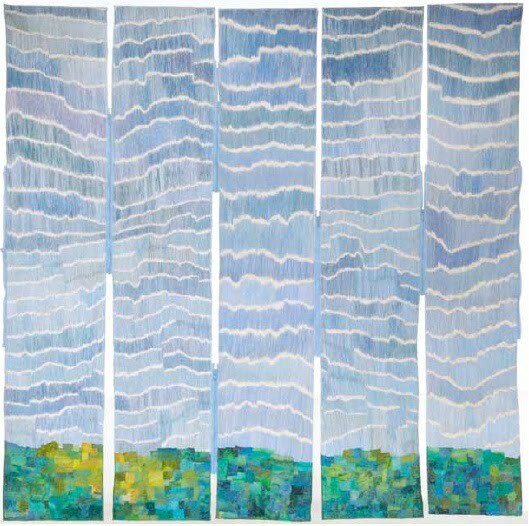 Urubamba by Jan Myers-Newberry showcases her exquisite shibori dyed cloth. 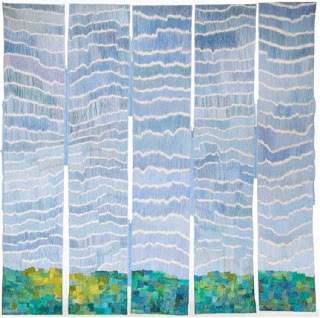 She has used a lively interplay of small and larger textures, warm and cool colors, and has created much energy and movement by connecting shibori patterns across many different fabrics. While Myers-Newberry's work showcases her fabrics, Frisian Sky by Dirkje van der Horst-Beetsma owes its pattern to her intense machine stitching. 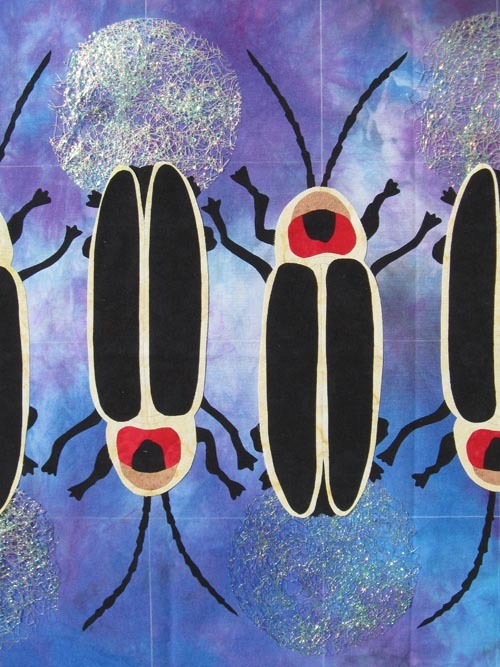 Horst-Beetsma creates pattern with multiple small squares of hand dyed fabrics, and also with stitched lines on whole cloth. 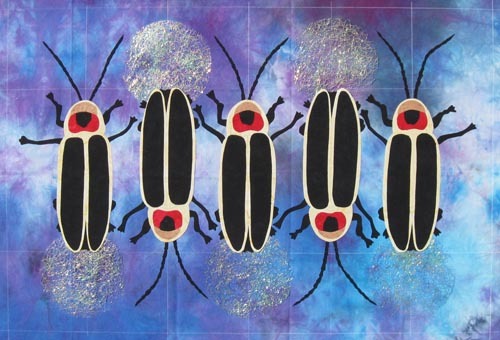 This piece consists of five panels that are attached with zippers of varying lengths. There are even half zippers on each side, indicating that the piece could be zipped together into a three dimensional column. Her thread choices make the sky lively. Her sky abstraction tugs at memories of beautiful sunny days. Rise Nagïn works with sheers. They may be layered, painted, appliqued or any of the other techniques of the quilter. By working with sheers, light becomes a constant in her work. 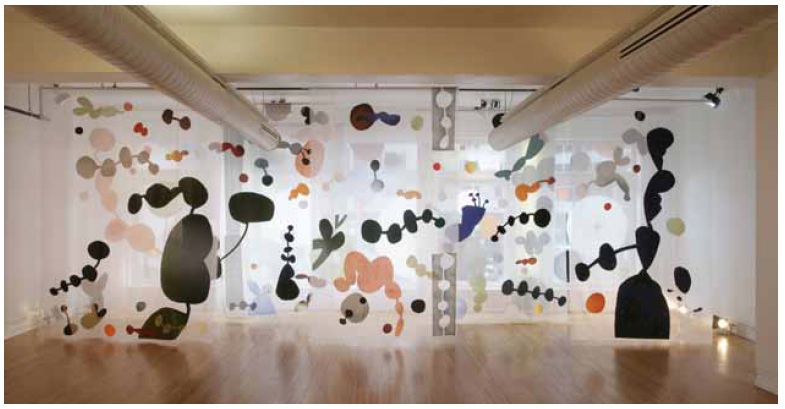 Heliotaxis at 138 x 420 inches ( 3.5 x 6 m) is large enough for the audience to walk in and among its panels. The energy of the piece comes from the overlapping layers of abstract organic designs, some in the foreground and some shadowed in layers behind. Each of the artists in the book has developed their own signature styles, but the book shows how one can work within a very defined oeuvre and still be growing and changing. Please leave a comment about this book on the blog with your email address by August 23. One lucky person will win a copy of this book. This week, I started work on one of the pieces I am doing for Fiber Art Options’ exhibition called “Meadowood Stitched,” which will premiere this fall at Daniel Stowe Botanical Garden near Charlotte. All the pieces will be based on meadow life, to celebrate the opening of a new section of the garden that includes meadow and woodland. “What the heck does that mean?” I can hear you all thinking. Well, synchronous fireflies are a phenomenon that you can only observe in two places in the entire world – the Great Smoky Mountains in Tennessee, and Southeast Asia. The Smokies are only about four hours from where I live. My mother told me about this phenomena demonstrated by the species Photinus carolinus, and she went to see it in the Smokies, but my family has not made the trip yet. According to a website for Gatlinburg, Tennessee, “This species of fireflies has an internal sensor that lets them know when a nearby firefly has lit, in which they respond with their own light as quickly as possible. It may take a minute for them to get in sync, but all of a sudden that start performing together with flashes that last as long as six seconds. This, in turn, presents an amazing wave of blinking lights that is truly astonishing.” You can watch a video about these fireflies here. The name made me think about synchronized swimming, which in turn made me think about cute little beetles lined up in the night sky in perfect formation, like the synchronized swimmers in the Olympics, firing up their little green lights at just the perfect moment in an outstanding example of simultaneous bioluminescence, tiny swim caps on their heads. Okay, maybe without the swim caps. So I made five little fireflies and arranged them in a position reminiscent of the synchronized swimmers. Their lights are made of Angelina fiber that reflects the light and gives them their signature glow. The fabric is a piece I hand-dyed last summer; I picked it because it reminded me of twilight, the gloaming – the time between twilight and dark. As a child, I spent many a summer evening in Pennsylvania with friends, chasing and catching lightening bugs (another name for fireflies) and putting them in Mason jar to make a lantern. It was magic. I didn’t realize until recently that there are no fireflies in the western United States. 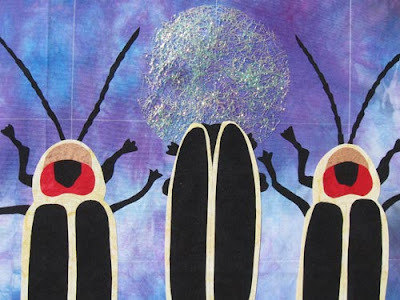 My husband had them in Oklahoma, but when I took a class with California artist Jane LaFazio when she came to North Carolina last June, she was all abuzz because she had seen fireflies the night before. Apparently they don’t have them in Europe, either. How sad! What’s next for this piece? I’m going to add some grass coming in on either side. The finished size needs to be 24" square. I think it will be very orderly grass, to emphasize the very orderly nature of the insects. And then I will thread sketch the fireflies, and quilt it. I’ll post more photos as it progresses. Fiber Art Options will be featured October 8 at the ninth annual “Barnful of Quilts.” This year’s show will benefit Samaritan’s Purse, an organization that provides food, medicine and assistance to the world’s poor, sick and suffering. 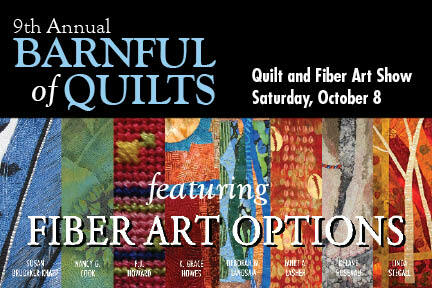 The show will feature exhibits, vendors, a bake sale and a quilt sale. Admission is a $5 donation to Samaritan’s Purse; it is free to those older than 80 and younger than 18. The show is in the amazingly beautiful barn at Fox Farms in Waxhaw, just south of Charlotte, NC. For information, e-mail Valerie Fox at vfox@windstream.net, or call 704-516-8060. We will have more information on this blog as we get closer to the date.